Exclusive model shoes - boots of Santa Claus! Made of synthetic leather. Sole micropores lining - textiles, heel 2cm. Boots Santa Claus, with the universal hologram. There will be a wonderful addition to the suit of Santa Claus. We offer Boots Santa Claus in various colors and styles, in different forms. For special order, refer to the contacts! Order this model! Before the holidays everything is available in large quantities! Bellow you will find a folk dance shoes manufactured by "Sudarushka" size chart. 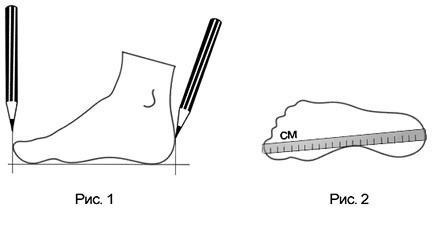 To choose the proper shoe size you need to draw contours of your sole with a pencil on a sheet of paper. The pencil must be held strictly perpendicular to the sheet surface. Using a measuring instrument (ruler, etc. ), measure the maximum length of the footprint you will get (in the widest points of the footprint).